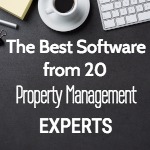 Rentec Direct surveyed 20 leading real estate experts to share what features and qualities create the best property management software. Expert advice from the leading real estate professionals on the best property management software. The survey examines what features and qualities create the best property management software, for property managers and landlord looking to purchase a program to improve business operations. Rentec Direct released the results of an industry survey in which 20 leading real estate experts answer questions essential in aiding a real estate investor or manager in making an important business decision. 1. What’s the number one thing to look for in property management software? 2. What’s the biggest red flag? Sabrina Bower, President CIC Reports; Jason Hartman, CEO at JasonHartman.com; Mark Ferguson, Founder Invest Four More; Andrew Cordle, Founder National Association of Real Estate Investors; Mark Juleen, The Apartment and Internet Marketing Nerd; Joe Samson, Great Calgary Real Estate; Victor Lund, CEO REtechnology; Bart Sturzl, President of National Association of Residential Property Managers; Dan Pipito, ez Landlord Forms; Aaron Kardell, CEO Homespotter; Tyler Zey, Easy Agent Pro; Jim Smith, CEO/Broker The Property Management Company; Debbie Biery, EXP Realty; Julie Nelson, The Nelson Project; Trevor Mauch, Founder Carrot; Rachael Hite, Listing Depot; Thomas Espy, International Editor at Tranio.com; Nico Hohman, NextHome Discovery; Anthony West, Moffitt Realty; and Lee Davenport, Learn with Lee.